We recently received a note from the great niece of Rifleman Ernest Miles who was killed while serving with 1/18th Bttn, London Regiment near Ypres during June 1917. 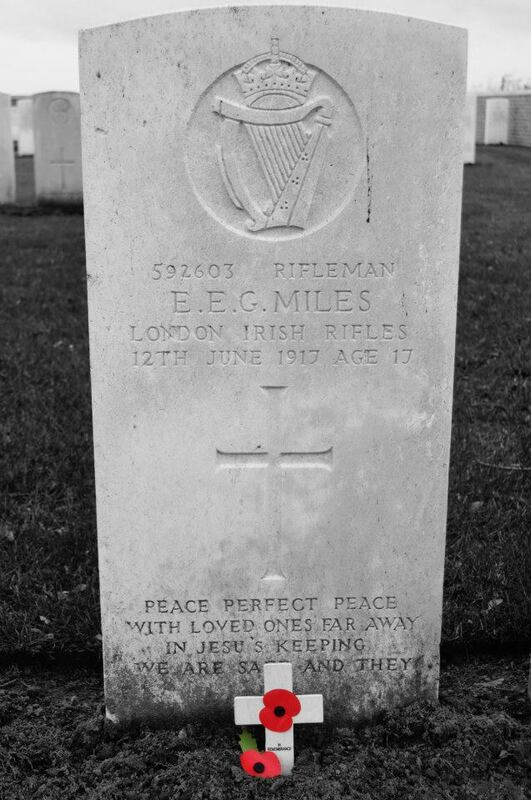 A remarkable element of Rifleman Miles’ story is that he is listed by the CWGC as being aged 17 years at the time of his death.. but, in fact, the family believe he may actually have only been 16 years old. cannot find anything new…. most of all, I would love to see a photograph of him. Hoping you can help me. “Ernest was the youngest of eight children… and I did see today on Ernest’s birth transcript that he was born in the third quarter (I presume either July, August or September) of 1900 so that actually made him just 16 when he was killed although his headstone states that he was 17, so we can only come to the conclusion that he lied about his age, or that he was a little more honest and the recruiter signed him up anyway.